First published in 1993, Allan’s classic guidebook is still considered the ultimate authority on New York City calm. It also launched the 50 Best Places series published by Rizzoli that included 23 titles and sold more than 350,000 copies. Now in its 6th edition, Peace And Quiet takes readers to soothing urban sanctuaries throughout the five boroughs from serene gardens and rooftop sanctuaries to soothing spas and meditation centers. The book’s success inspired Allan’s website findpeaceandquiet.com. The only guidebook of its kind that the Parents League of NY rated “Indispensable,” Allan’s best-selling title remains the #1 printed source for fun in New York City. Since 1998, it has helped kids and parents discover unforgettable adventures on every corner, in every borough. Allan’s Tranquilicity’ app is the instant locator for refuge, relaxation and renewal in New York City. Using GPS guidance, it pinpoints the way to more than 100 carefully selected serene parks, soothing day spas, quiet meditation spots, rejuvenating yoga studios, waterfront retreats, secret sanctuaries, and more. It’s the ideal application for native New Yorkers, savvy tourists, the stressed out and the tensed up, anyone looking for a calming counterpoint to a fast-moving city. The book that proves that weirdness still lives in the world’s greatest city. Unconventional and unexpected, ODD NEW YORK lures readers off the beaten path to a quirkier side of New York ‘ from a mummified nun in upper Manhattan to the city’s wickedest witchcraft store, from a kitschy mermaid parade in Coney Island to the oldest transvestite training school in America. 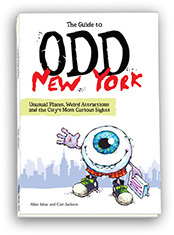 Conceived and written by Allan with Cari Jackson, ODD NEW YORK includes more than 100 offbeat entries and 60 eye-popping photos, reminding us that New York is still the capital of kookiness. Based on a character developed by Allan in the 1990s, Hard Hat Harry was a beloved children’s video series that offered a fun and educational way for kids to learn about the way the world works. Written and created by Allan for children ages 3-10, the action-packed series followed a magical construction worker genie as he guided kids through dozens of exciting adventures. The collection began with Real Life Construction Equipment For Kids and included 24 more episodes. 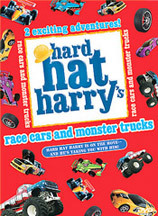 There are more than 2-million Hard Hat Harry videos and DVDs in circulation. The series won two Telly Awards for excellence in television and video. Allan’s Metropolitan Diary reflections on 9/11, thirteen years later. Allan explores the physical tension and need for connection in relationships between men and boys. Allan’s recommendation for the Boy Scouts in response to the entrepreneurial spirit of the Girl Scouts.